Bee Happy - Weary of oil sprayers that clog? * Fill, Pour, Baste & Store light liquids in convenient silicone dispenser for later use * No clogging! 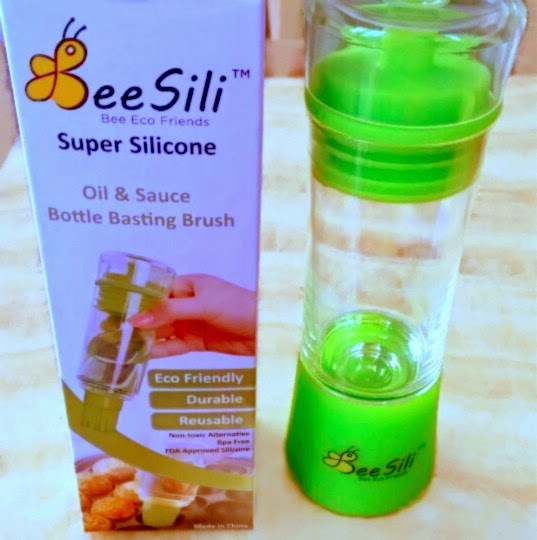 Bee Risk Free - Love using your Bee Sili Super Silicone Basting Bottle Brush & Food Storage Container or get a 100% refund! This is a must have in my kitchen now! I like to cook with olive oil quite often, and I really like infusing flavors into my olive oil. I can take this bottle, fill it up with my olive oil, add in my herbs and spices and let it sit in there until I need it. That's when it becomes super handy. When I want to pour on some of the oil, I just take off the plastic cap and pour some out. Put the cap back on and I'm done. If I need to brush the oil on I can then remove the cap covering the bristles and brush on the oil. Super easy and handy. In addition to olive oil, I have actually also used this with BBQ sauce. Fill it up with the sauce, and take it out with you to the grill. Having the brush attached is very convenient, plus since the brush has a cover, it is also mess free! The brush cover is fantastic because it keeps this a bit more sanitary and also allows you to stand your bottle upright. This is a huge hit in my household, and it is being used on a weekly basis! Love it!